I have an update on the nasty publish/selection bug that been plaguing some Lightroom users of late, in the selection shown in the grid is sometimes wrong. 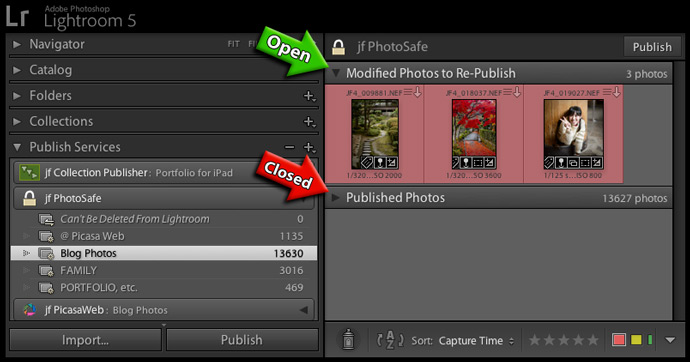 It seems that the bug exists only when Lightroom is started with a section in the Publish Segmented Grid (“Modified Photos to Re-Publish”, etc.) is closed. So, if you ensure that all segments are open, then restart Lightroom and maintain them open, your grid-selection experience should be bug free. The opened/closed state of each grid section is globally shared among all collections, so opening all four possible sections (New, Modified, Deleted, and Published) once takes care of it everywhere. Bug or not, you can always trust the selection shown in the filmstrip, so until this workaround is confirmed for sure, it's best to keep the filmstrip open so that you can notice any divergence. This seems to be a big breakthrough in understanding this bug, and I know that Adobe is aware of it (because they tipped me off to the workaround to begin with), so I have hope we'll see a fix sooner rather than later. I really hope “sooner”, because being able to close a grid section is the only thing that makes the segmented grid useful in large collections. I wish the current grid header would be sticky to the top of the screen as you scroll so that you know what section you're in if the header doesn't happen to be visible. I have some collections with more than 100,000 items, making a visual search utterly impracticable. Even a relatively small collection of 2,000 photos makes for 300+ rows of thumbnails to scan; very unfun unless you get lucky. This just reinforces my premonition that there is some unclosed parentheses somewhere in some computer file in some server attached to something important that will one day blow up the world. Brilliant work! Your plug-in saves a ton of time. Many thanks.